Rutgers Health, as New Jersey’s premier academic health care provider, integrates educating students, providing clinical care, and conducting research with the goal of improving health for the people of New Jersey. We bring together the knowledge of member institutions that are part of Rutgers University, one of the top research schools in the United States. At our core are faculty – teachers, clinicians, and scientists – with outstanding experience in treatment, research, and patient care. Our faculty focuses on advancing medical innovation and providing patient care driven by the latest studies. Our patients benefit as we provide each with access to the latest treatments and research so close to home. Much of our innovation in research-driven patient care is propelled by an affiliation with our two principal teaching hospitals, Robert Wood Johnson University Hospital in New Brunswick, NJ and University Hospital in Newark, NJ. Robert Wood Johnson University Hospital (RWJUH) New Brunswick is a 600-bed academic medical center that is the principal teaching hospital of Rutgers Robert Wood Johnson Medical School and the flagship cancer hospital of the Rutgers Cancer Institute of New Jersey. RWJUH is known for its medical excellence in so many specialties including cardiovascular care – from minimally invasive heart surgery to transplantation, cancer care, stroke care, neuroscience, orthopedics, bariatric surgery, and women’s and children’s care including The Bristol-Myers Squibb Children’s Hospital at Robert Wood Johnson University Hospital. RWJUH also has a Level 1 Trauma Center and the first designated pediatric trauma center in the state. RWJUH has been ranked among the best hospitals in America by U.S. News & World Report seven times and has been selected by the publication as a high performing hospital in many specialties. The Bristol-Myers Squibb Children’s Hospital has been ranked among the best hospitals in America by U.S. News & World Report five times. In addition, RWJUH was named among the best places to work in health care by Modern Healthcare magazine and received the Equity Care of Award as Top Hospital for Healthcare Diversity and Inclusion from the American Hospital Association. The hospital has earned significant national recognition for clinical quality and patient safety, including the prestigious Magnet® Award for Nursing Excellence and “Most Wired” designation by Hospitals and Health Networks Magazine. 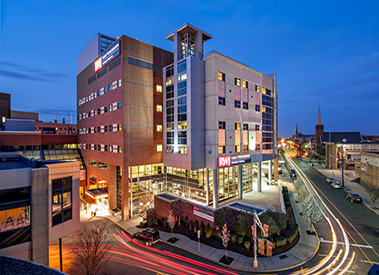 The American College of Surgeons’ Commission on Cancer has rated RWJUH New Brunswick among the nation’s best comprehensive cancer centers. 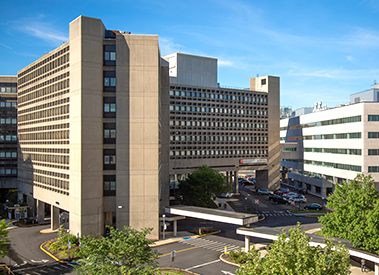 University Hospital (UH) in Newark is a 519-bed independent, state-owned medical center that is the principal teaching hospital of Rutgers New Jersey Medical School. UH serves as a regional resource for advanced care in a wide range of medical specialties and critical care. The hospital is home to northern New Jersey’s Level I Trauma Center, one of only three in the state. UH ranks among the Best Hospitals in Northern New Jersey and the New York Metropolitan area, according to the Best Hospitals rankings, published by U.S. News & World Report. The hospital also has recognition for "high performance" in the clinical specialty of Nephrology. The only hospital in New Jersey to be awarded Gold Plus recognition for Heart Failure and Stroke and Target Honor Roll status, and one of only two hospitals in the state to be awarded Gold Plus rating for both Heart Failure and Stroke Care as part of the Get with the Guidelines initiative by the American Heart Association/American Stroke Association. The only hospital in northern New Jersey and one of only two in the state certified in Advanced Heart Failure Care by The Joint Commission. Certificate of Distinction for Advanced Certification in Comprehensive Stroke Center by The Joint Commission. RWJBarnabas Health and Rutgers have launched a public-private partnership to jointly operate a world-class academic health system dedicated to life-changing research, clinical training of tomorrow’s workforce, and high quality health care for all. This partnership represents a significant step forward to improve access to care and reduce the health disparities that impact our state. We are driven in this work by our shared belief that while we are strong leaders in our respective fields, together we are poised to transform health care in New Jersey and drive innovations that will improve outcomes across the country. Learn more about the transformational partnership in this video.